Trustees met via videoconference on Tuesday, January 8, 2019, for a regular Board Meeting. The January Kids Come First presentation titled ‘Bringing the Learning OUT through Coding’ was received by Trustees. Doris St. Jules, Principal of Lillian Berg Public School, and Shannon Elliott, Grade 5/6 Teacher, were joined by Lillian Berg Public School students to share their experiences in coding with Trustees. The students shared some insights into coding, including a definition of coding, why it is important, and what they’ve learned through coding. Trustees heard how the students are learning about perseverance, innovation, creativity, problem-solving and teamwork through their coding activities, with some students even designing their own video game. Elliott shared how proud she is of her students and how coding encourages them to take risks, teaches them not to be afraid to make mistakes and to celebrate their successes when they overcome challenges. Tim Flynn, Principal, Nicole Vingerhoeds, Vice-Principal, and student Isaiah Stahls from King Geroge VI Public School in Kenora presented the Special Education Assistive Device presentation. Students at King George and schools across the Board area are using technology to support student learning, including different assistive technology and devices for Special Education students, including students with learning disabilities. Technology, and in particular assistive technology, helps to remove barriers to learning for students. Isaiah shared some of his experiences with using assistive technology, including how it has supported him in completing his assignments by allowing him to use speech to text for writing rather than pen and paper, an area he struggled with in the past. He shared with Trustees that he can write faster using the technology and that it helps him not to get frustrated with his school work so he can focus on completing his assignments. Isaiah’s mother, Robyn, shared that they have seen improvement in many different areas since the introduction of assistive technology to support him in the classroom. A visit to Dryden High School by Federal Minister of Crown-Indigenous Relations and Northern Affairs, Carolyn Bennett, where she met with students who are a part of our Four Directions First Nation, Metis and Inuit Graduation Coach approach. 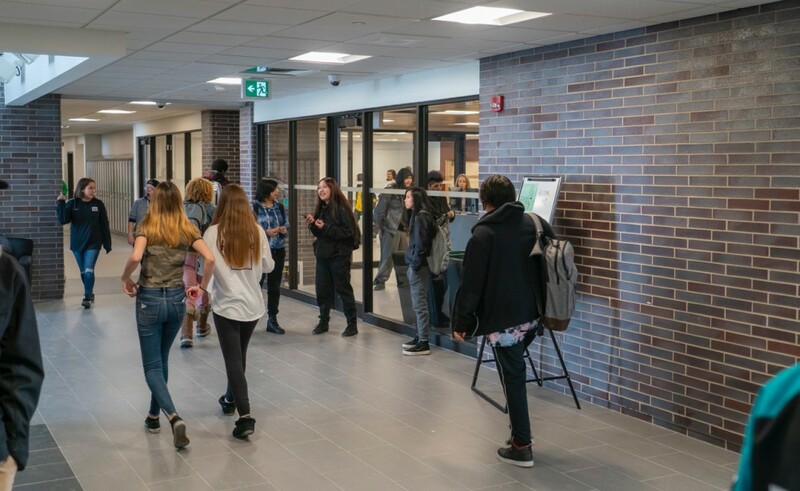 The KPDSB’s Four Directions approach has received National attention with our first graduating cohort in June 2018 from Dryden High School showing a 40 percentage point increase in the number of self-identified students graduating from Dryden High School compared to previous averages. The Four Directions approach was also recognized by Indspire at the 2018 National Gathering for Indigenous Education in Edmonton, Alberta, where Tania Sterling, Superintendent of Education, was presented the Indspire Nurturing Capacity: Documenting Community plaque. The appointment of two of our students, Drea Sinclair from Red Lake District High School, and Tristan Bouchard from Sioux North High School in Sioux Lookout to the 2018-2019 Minister’s Student Advisory Council. Drea and Tristan were chosen from more than 400 applicants from across Ontario. Crolancia Public School in Pickle Lake was named the first Gord Downie & Chanie Wenjack Fund Legacy School in Canada. 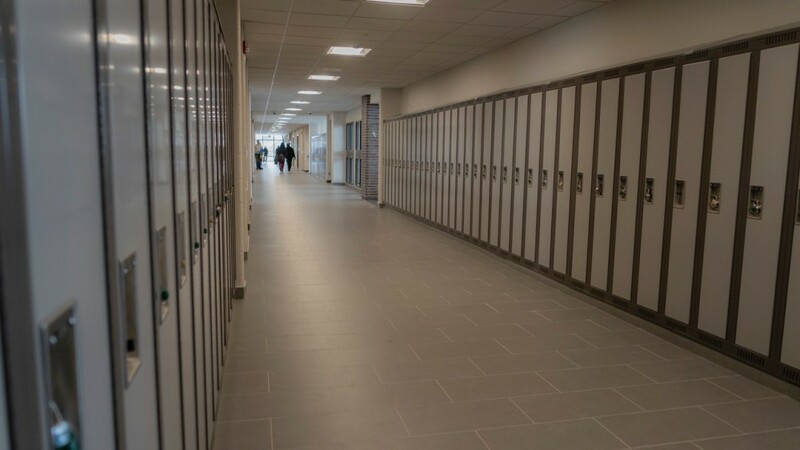 The school has a variety of initiatives planned to honour the designation, including the dedication of two benches outside of the schools, the dedication of the school’s Native as a Second Language classroom as the Legacy Classroom, and the renaming of the school’s end of the year NSL award. The KPSDB became the first school board in Ontario to register all of its schools for OPHEA Healthy Schools Certification. OPHEA’s Health Schools Certification recognizes and celebrates school communities for promoting and enhancing the health and well-being of students, school staff, and the broader community. To view the 2018 Director’s Annual Report, please click here. Richard Findlay, Superintendent of Business, presented the Ear Falls Public School Capital Project update. Construction is set to begin on the $5 million project for the total renovation of Ear Falls Public School. The project will be done in two phases, with the first set to begin in March 2019, and the second beginning in June 2019, with completion anticipated for September 2019. Findlay also presented the Sioux North High School Capital Project update. 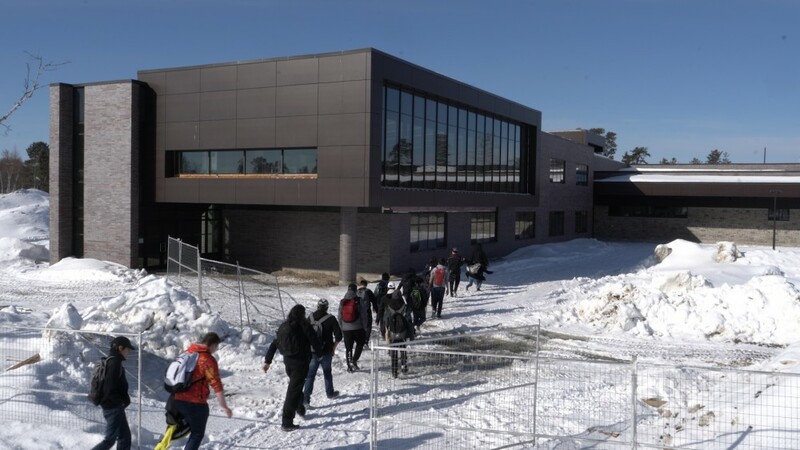 Work continues on our new school, Sioux North High School in Sioux Lookout, and excitement continues to build as we prepare to move into the new building from the old Queen Elizabeth District High School site. 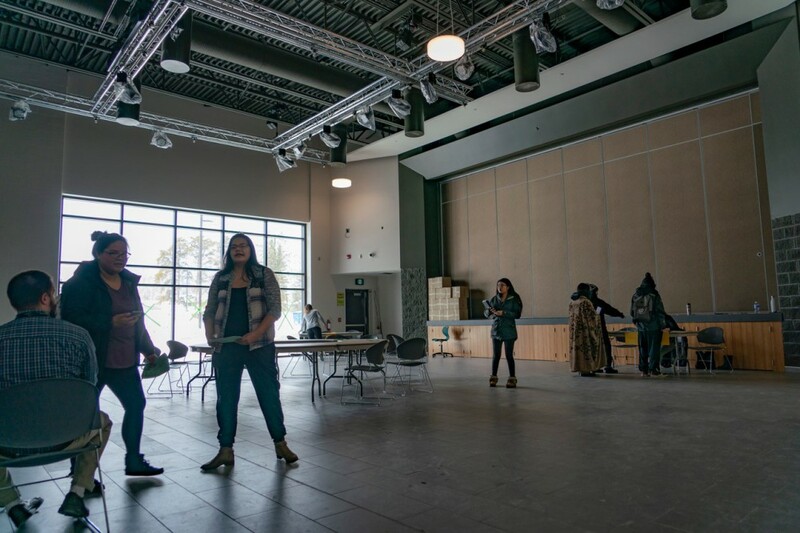 Spaces built for our partners in the building, FIREFLY and Confederation College, are now complete and staff from those organizations are beginning their move into the building. 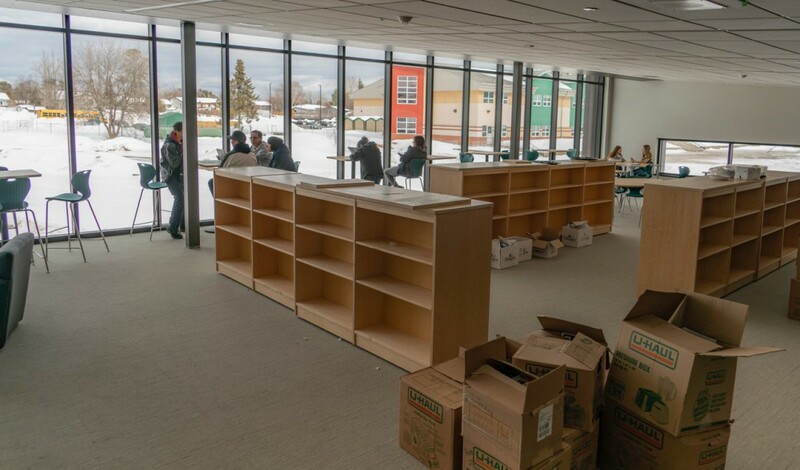 Staff and students are anticipated to move into the new building following the March Break. A grand opening for the new $30 million school is being planned for spring 2019. 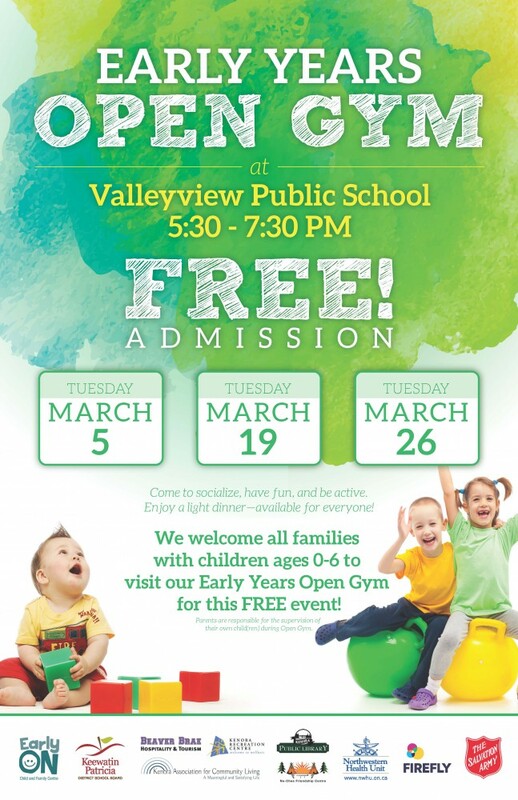 We are excited to announce the Early Years Open Gym in Kenora will continue during the month of March at Valleyview Public School. Families are invited to join us on March 5, 19, and 26 from 5:30 to 7:30 p.m. The Early Years Open Gym is a free event for children ages 0-6. It provides an excellent opportunity for families to socialize, have fun, and be active with their child(ren). New for the month of March, thanks to the Salvation Army, Chef Pitre and the Hospitality and Tourism class at Beaver Brae Secondary School, a light dinner will also be provided free of charge for families. The Early Years Open Gym would not be possible without the strength of community partnerships. We would like to thank all of our partners for working with us to ensure that kids come first. 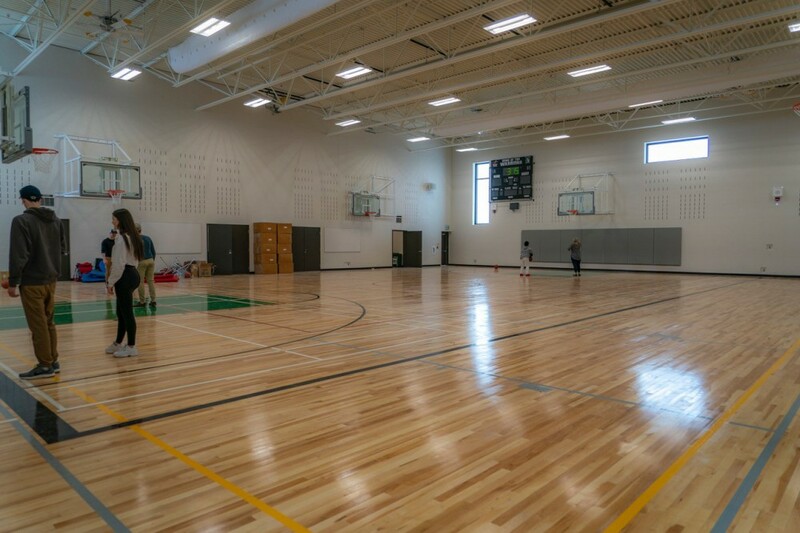 The Early Years Open Gym began in January and has been hosted at different schools in Kenora, with the March events taking place at Valleyview Public School. The Early Years Open Gym is a free community event to encourage physical activity and play during the cold winter months.